41%! Highest yet. I spent $123 and saved $86. The main reason I spent so little (thus upping the percentage saved) was that ShopRite was out of several items I ordered. So now I’m wondering if we can just make do without them. I hate to go out on a second trip, because when I’m physically in the store I make impulse purchases. For the first time in a long time, I used Living Rich With Coupons’ coupon database to find coupons. E.g., I always buy quarts of Stonyfield yogurt, but it will only be listed in the coupon match-ups if it’s on sale AND there is a coupon available for it. It wasn’t on sale this week, but the database showed there was a coupon for it on the Stonyfield website. Did the same for Bob’s Red Mill whole wheat flour and Filipo Berio olive oil. So altogether I had $13.20 in coupons and there was a $20 off $150 promotion again (I love them!). Best deals: Starkist tuna for $1 (it’s never that low anymore); Chef Boyardee ravioli for 80 cents/can (must buy 10) (my husband loves it); Bounty Basic paper towels for 83 cents/roll (or less, if you believe their claims that the six-pack of rolls is actually eight rolls). 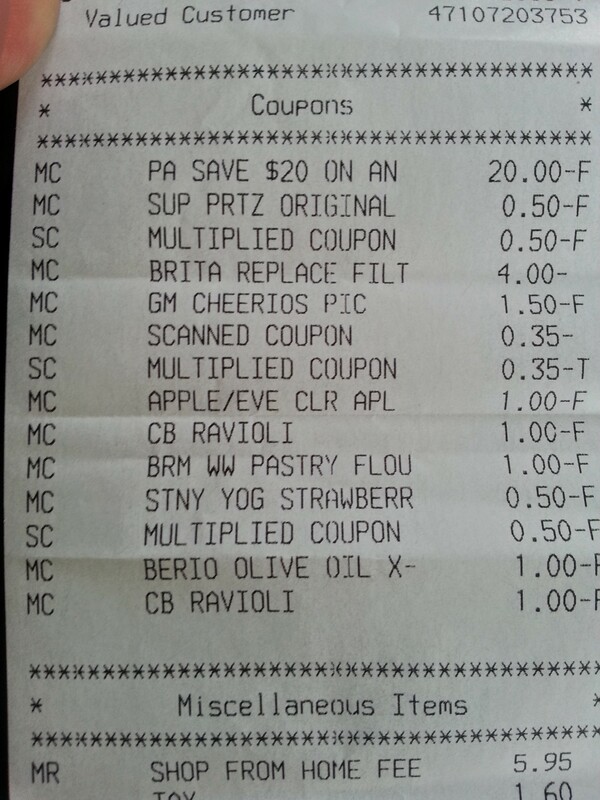 Correction, 5/7/14: The CB ravioli were actually 60 cents a can because I had two $1 off 4 cans coupons.